Dr Patchanita Thamyongkit holds a Bachelor of Science degree from Chulalongkorn University in Bangkok, Thailand and a Ph.D. in Organic Chemistry from Eberhard-Karls-Universität Tübingen, Germany. 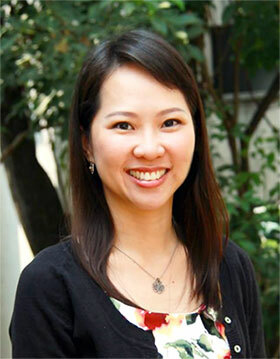 She conducted research at North Carolina State University, U.S. as a postdoctoral fellow before returning to Thailand to take up a position at the Department of Chemistry, Faculty of Science, Chulalongkorn University. She is currently an Assistant Professor in Chemistry while also serving the university as a ViceDean of the Graduate School. Her research concerns the development of organic photosensitizing materials for optoelectronic applications, especially organic solar cells and photoelectrochemical catalysts. Dr Thamyongkit worked as a Marie Curie International Incoming Research Fellow at Linz Institute for Organic Solar Cells. It is widely accepted that international cooperation in science and technology is crucial in dealing with many of today’s challenges which are of a global and transborder nature, such as environmental and health concerns. Enabling researchers to be mobile and to cooperate with each other across national borders is a key factor in tackling these challenges successfully. International cooperation including researcher mobility is a key element of the European Unions’ current Research & Innovation Programme Horizon 2020 (H2020) which welcomes top-class researchers from Third Countries (i.e. countries that are neither members of the European Union nor associated with it) to work on projects in and with Europe. Included in the "Excellent Science" pillar of Horizon 2020 are the Marie Skłodowska-Curie Actions (MSCAs) which will award EUR 6,162 million over the period 2014-2020. The objective of the MSCA is to support the career development and training of researchers – with a focus on innovation skills – in all scientific disciplines through worldwide and cross-sector mobility. For this, the MSCA provide grants at all stages of researchers' careers, from PhD candidates to highly experienced researchers, and encourage transnational, intersectoral and interdisciplinary mobility. The MSCA will become the main EU programme for doctoral training, funding 25.000 PhDs. Endowing researchers with new skills and a wider range of competences, while offering them attractive working conditions, is a crucial aspect of the MSCA. In addition to mobility between countries, the MSCA also seek to break the real and perceived barriers between academic and other sectors, especially business. The MSCA follow a "bottom-up" approach, i.e. individuals and organisations working in any area of research can apply for funding. Several MSCA initiatives promote the involvement of industry etc. in doctoral and postdoctoral research. Amongst the growing alumni network of this prestigious fellowship scheme are highly talented young researchers from ASEAN – 71 fellows from Vietnam, 36 from Thailand, 32 from Indonesia, 24 Philippines, 21 from Malaysia, 17 from Singapore, two from Myanmar and one from Brunei. Each month, EURAXESS Links ASEAN invites Marie Curie Fellows from countries within ASEAN to share their experience with our readership. This month we caught up with Thai researcher Dr Patchanita Thamyongkit who works as an Assistant Professor at Chulalongkorn University in Bangkok. Please tell us a little about yourself. Where are you from and what is your research background? I am from Bangkok, Thailand. I graduated with a Bachelor of Science degree at Chulalongkorn University and received my Ph.D. in Organic Chemistry from Eberhard-Karls-Universität Tübingen, Germany. After that, I had conducted research at North Carolina State University as a postdoctoral fellow for approximately 3 years. In 2005, I came back to Thailand and get a position at the Department of Chemistry, Faculty of Science, Chulalongkorn University. Currently, I am an assistant professor in Chemistry and also serve the university as a vice dean of the Graduate School. My research concerns the development of organic photosensitizing materials for optoelectronic applications, especially organic solar cells and photoelectrochemical catalysts. Please tell us briefly about the research project you have been doing as a Marie Curie Fellow? The project was about the synthesis and investigation of porphyrin-based photosensitizers for optoelectronics devices under the collaboration with Linz Institute for Organic Solar Cells (LIOS) at Johannes Kepler University Linz, Austria. At that time, my research groups in Thailand took care of the synthesis part under my supervision, while I intensively performed the investigation of photophysical properties and device studies at LIOS. Why did you choose to apply for this particular project? As a chemist, I believe that the organic compounds play important roles not only as promising light-harvesting candidates, but also as perfect materials in mechanistic studies to understand more the key factors for successful devices. As a Thai and world citizen, I think it is a global urgent need to provide the proper technology for making use of alternative source of energy, especially the solar energy. Therefore, I have strong intention to extend my knowledge, and to get sustained and fruitful research collaboration in this field. Thanks to my Ph.D. advisor, Prof. Dr. Dr. h.c. Michael Hanack, who introduced me to o.Univ. Prof. Mag. Dr. DDr. h.c. Niyazi Serdar Sariciftci who is a director of LIOS and suggested me to write a project together. Where did you get information about the MC Actions? Prof. Sariciftci suggested that we should submit our project proposal to get International Incoming Fellowship (IIF). That was the first time I heard about this. I think the committee could clearly see from my project proposal “why” I want to do this, “what” I would like to do and “how” I can drive the project to the goal. My solid research expertise and continuous publication should convince them that the project will be fruitful, while my academic position at the university should make them see my ability and the great possibility of knowledge transfer. Last but not least, the high reputation of the host institute must play a big role for this success as well. Do you have any advice for other young researchers who are considering applying for a MCF? There are lots of things you can contribute for your research society. Find the corner fitting you and use your strength to do the best with it. Then, you will be a perfect candidate! What were the most significant benefits you derived as a MC Fellow? Prof. Sariciftci is a great collaborator and a very generous boss. I have received a life-long membership from his institution, LIOS. This privilege provides me opportunities to participate their research activities and visit there for performing experiments whenever I would like to. This is such a kind offer from him that motivates me to do the better research. Furthermore, he always gives me the best support beneficial for my career path. What do you think were your most valuable contributions to your European host? Besides awards and publications I have got, I think I created another research point of view in LIOS in terms of “using more chemists/chemistry” in their work. Working with them for two years made our collaboration highly synergistic because we know how to enhance our research outcome by combining the strength from each side. Now they know more how to make use of the chemists! I want to see the research and development in the field of organic optoelectronics in Thailand upgraded to the world standard and to be in the competitive level. I would like to establish my research unit as a research and education center to produce high impact outcome, to create knowledge and to educate young generation to be qualified researcher in this field. I am confident that this is not just a dream. Thank you very much Dr Thamyongkit!